Wellstead is a small rural town situated in Western Australia in the Great Southern region between Albany and Esperance. The name commemorates the Wellstead family who settled in the area in 1860 and had held grazing land between Cape Riche and Bremer Bay. Farmland was opened up in the area in the 1960s for cereal cropping and land was set aside for a townsite.The townsite was gazetted in 1965 shortly after establishing a telephone exchange. John Wellstead still lived in the area in 1881 and sold 700 head of cattle via the market in Albany early the same year. He died in Albany in 1896 but his sons, including John Jr., continued the family pastoral interests in the area. ^ Australian Bureau of Statistics (25 October 2007). "Wellstead (State Suburb)". 2006 Census QuickStats. Retrieved 28 October 2008. 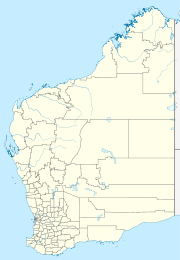 ^ Western Australian Land Information Authority. "History of country town names – W". Retrieved 29 October 2008. ^ "Classified Advertising". The West Australian. Perth: National Library of Australia. 15 February 1881. p. 2. Retrieved 8 June 2012. ^ "Mrs. J. Wellstead Sen". Western Mail. Perth: National Library of Australia. 10 August 1907. p. 15. Retrieved 8 June 2012. ^ "CBH receival sites" (PDF). 2011. Retrieved 1 April 2013.